Angle grinders (UŞM, Bulgarian) under German Bosch brand are of high quality, reliability and durability. The main competitive advantage of Bosch angle grinders lies in the widespread use of innovative technologies in the manufacture of products. But German quality can not resist the Russian negligence. Misuse tool, Failure to replace the grease, carbon brushes, bearings leads to failure of the tool. For, to perform repair angle grinder Bosch, you can go two ways: grinders give to a service center or a Bosch grinder to repair their own hands. The first option is more expensive and not always quality. The second option can be achieved only if the consumer a great desire all to understand yourself. Driving grinders Bosch will perform the repairs yourself. Bosch grinders are divided into low power to 1000 W, and powerful over 1000 W GWS have marked 7-125, GWS 20-230 or others. The first digits 20 or more indicates a power tool 1000 W. The second digit 230 certifies, that is the maximum diameter of the cutting wheel. The first figure to 20 It testifies to the power tool 1000 W, and the second on the maximum diameter of the cutting circle to 125 mm. Feature grinder Bosch design presented in the application as a gear bearing of the driven helical gear needle podshipnika.V perforators Bosch driven gear on the spindle shaft is fixed by compression. The low power grinder Bosh, in which the gears are placed in the spur gear, accommodate shims. This design allows you to recover from the gears contact, reducing the thickness of the gasket. Helical gears at high speed tool wear significantly less than the spur. Among the works of Bulgarians most often is a dusty space. Dust is the primary hazard, leading to failure of power, amorous and grinders. To repair grinders Bosch, the tool can not do without. Outset, if you have Cordless, this greatly accelerate the disassembly and assembly of the tool. But you can do a set of screwdrivers, preferably Ratchet. Do not do without the spanner, which will lead to unscrew the nut of the helical gear. For dismounting of bearings is better to have a special puller. Diagnosis of the electrical part can be carried out by using a tester or Device determining short-circuit windings. 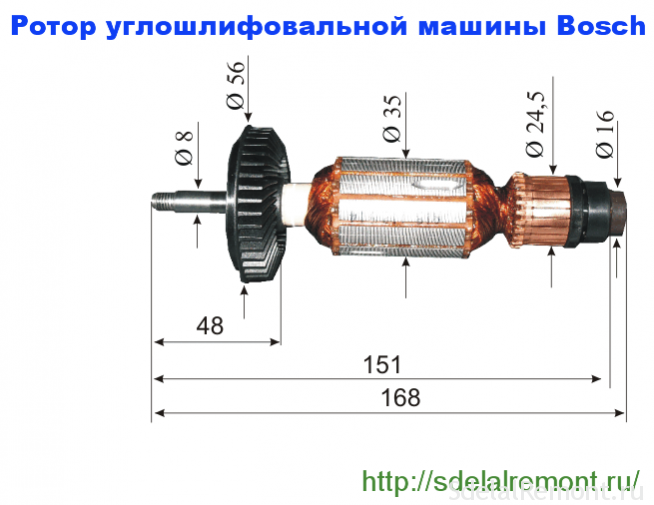 It is especially useful for those, that allows you to identify problems with the rotor or stator, without removing unit. Driving grinders Bosch will perform the repairs yourself, and this instruction will adequately cope with any problem. To power its owner's knowledge and ability to disassemble the device is a mandatory task. Knowledge about dismantling grinder allows itself to carry out such work, as a replacement for grease, change of bearings and carbon brushes. 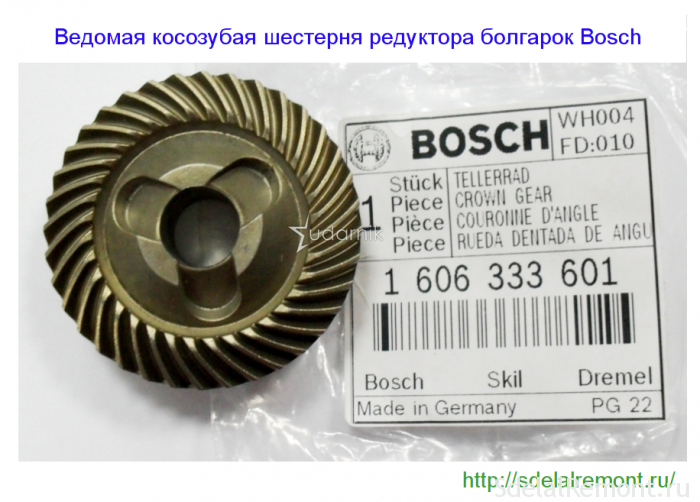 To disconnect the gear housing poz.821 poz.888 from the stator housing, it is necessary to disassemble(shoot) body handles Bulgarian poz.24. This operation is necessary to perform, to get the carbon brushes poz.810, holding the rotor manifold. In the second stage unscrew 4(four) screw poz.61, securing the gearbox casing and the stator. Pulling the rotor together with gear, proceed to disassemble the gearbox. Repairs grinders Bosch begins with disassembly poz.821 gear. Dismantling the gearbox starts with twisting 4(four) screws poz.60. Usually, factory screws screwed on sealant. We'll have to make some effort. Just note! 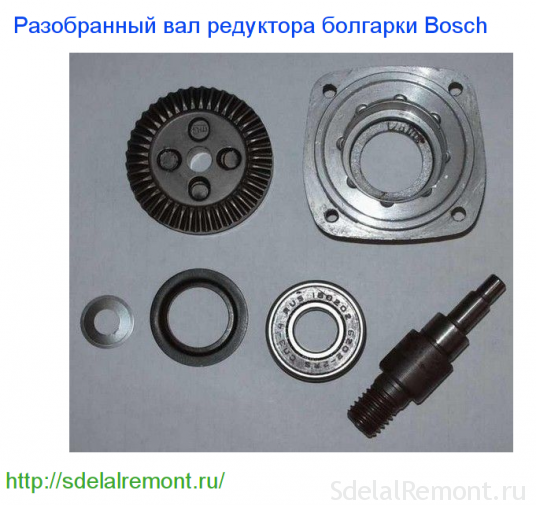 Bulgarians have low power Bosch gearbox used spur gear. Bulgarians have power over 1000 W gear units are used helical gears. After removing the gear cover, you can get a helical gear unit at 26. 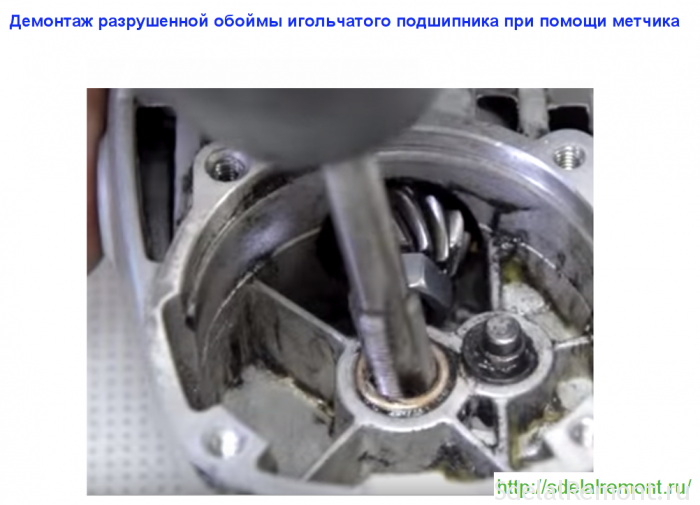 To remove a gear wheel, it is necessary to use a press or puller. But the use of a stripper difficult, because it requires the use of special thin sponges. Before removing the helical gear, Check backlash gear connection, tooth integrity, contact patch. On the spindle shaft bearing is crimped at 26 poz.50. If the bearing has a large backlash, noise when scrolling, dry lubricant, it is preferable to replace. To remove the bearing, necessary to remove the gear, and removing the circlip bearing. 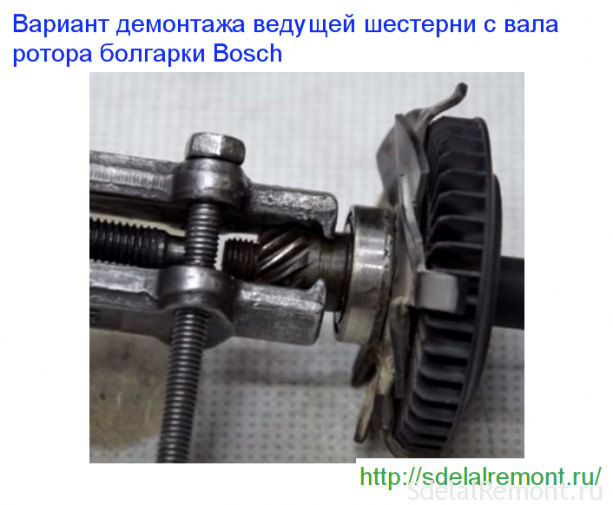 If, during disassembly of the rotor shaft bearing assembly it remains in the gear housing, Bearing disassembly is done with a hammer and a soft nastavki. pull out a lead helical gear poz.27. Visually inspect the integrity of the gear teeth, contact patch. If the gears are worn out (slicked), has chipped teeth, then they must be replaced. And, replacement gear is always done in pairs. The low power grinder Bosch as a support bearing used in the gearbox needle bearing. 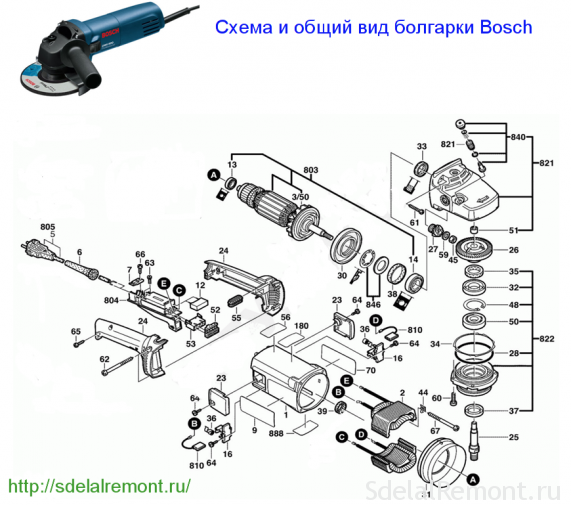 Repair bosch angle grinders with their hands strictly follow the enclosed instructions. If you need to remove the needle bearing from the housing, without intelligence can not do. Its dismantling is carried out only in the destruction of. To get ruined bearing race, you can use a proven way. Selected tap diameter, a slightly larger inner diameter of the holder of the destroyed needle bearing. The tap is fixed in the cartridge screwdriver and twisted gently at low speed in a clip. When the tap reaches the bottom of the gear housing, it will begin to lift cage. Furthermore needle bearing spindle shaft, in Bulgarian Bosch applied two more bearing, mounted on the rotor shaft. To disassemble bearing rotor poz.803 grinder Bosch recommended pullers. Bearing poz.15 near the collector is removed easily, but for the removal of the bearing pos.14 from the impeller becomes complicated, it is necessary to perform a series of preparatory operations. Bearing poz.15 closed soft rubber socket. Similar protection poz.33 rubber covers and bearings pos.14. it is necessary to dismantle the bearing pos.14 unscrew the nut poz.45, remove spur gear poz.17 and plastic protection poz.33. Applying the puller can be easily removed from the bearing of the rotor shaft. And if not a stripper? Come to the rescue of a vise, two metal strips and a hammer with a soft metal nastavkoy. Malfunctions of the electric grinder Bosch can be divided into simple and complex. If you include grinders, and she refuses to work, start looking for the problem to break the power supply wires. Most often broken wire manifests itself in the place of entry into the grinder or in the plug. Avoid twists, this will lead to a short circuit in the instrument. To determine such failure is necessary to open the lid handle grinders. The Bosch to Bulgarian 1000 W cover is fixed with one screw on the end. We Bulgarians over Bosh 1000 W lid handle is secured by several screws. 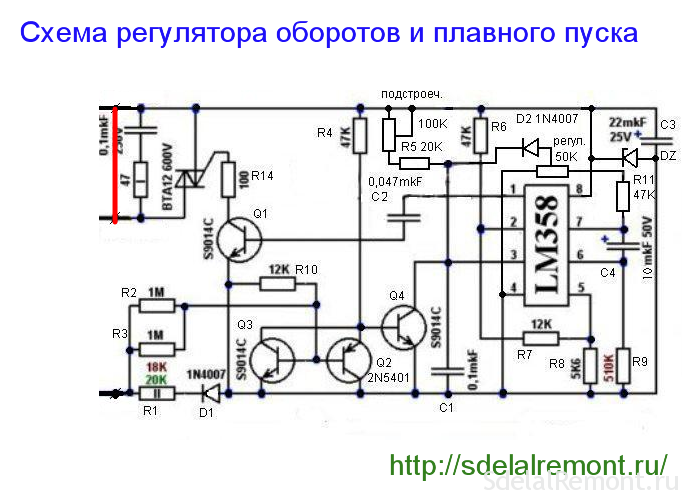 Using the tester prozvoniv supply circuit from the input to the switch fork pos.5. When a chain proceed to check switch operation. The Bosch grinders used a simple switch, operated switch lever. 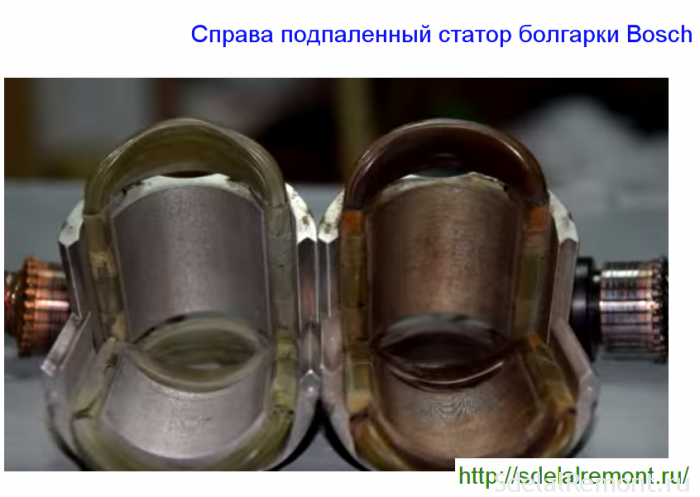 But electrical switch contacts burn and become a cause of failure in Bulgarian. Restoring contacts plastic switch inexpedient, should be changed to the new. If the switch is intact, using a tester check the continuity of each pin plug to each coal schetki.Pri entire Bulgarian chains should include. If you do not rotate, the failure of the mechanical part. Possibly jamming the gears or bearing failures. 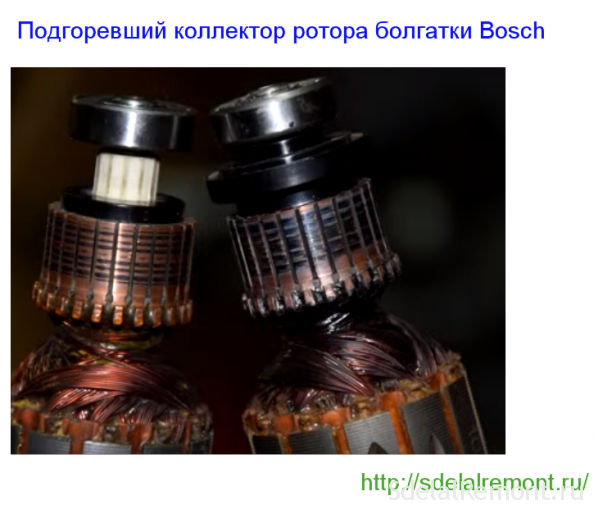 If your Bulgarian Bosch grows regardless of you, It begins to bask, iskritь, it is necessary to pay attention to the integrity of the rotor windings, stator. Involuntary set LBM speed indicates a fault in the stator windings. The integrity of the windings checked tester, and short circuit between turns checked by a special device. Rotor repair is a complex process, Available masters with straight arms. On rotor fault indicates engine speed drop, appearance of one of the long brushes sparkling trace. This is the first sign of a short circuit of windings of the armature winding. Repair of the rotor is preferably performed in special workshops. And you can rewind and self, if you have decided to repair their own hands grinders Bosch. The dark color of the rotor winding and burnt commutator bars indicate a short circuit in the rotor circuit. The fault can only be eliminated by replacing with a new rotor. Repair Angle bosch machine includes a stator and recovery. The main symptom of a failure of the stator is a spontaneous increase in running speed grinders, that it is impossible to reduce the stator winding regulirovkami.Podgorevshaya changes color, Darkens. The stator core of a high temperature also darkens. 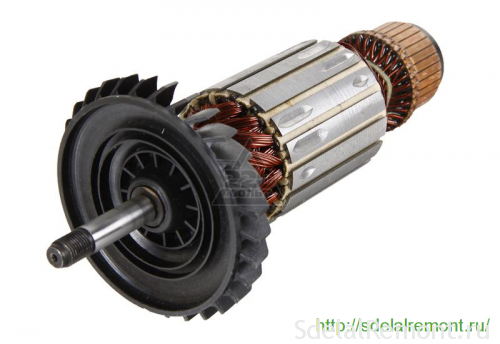 Stator rewinding easier, although here it is necessary to observe certain rules and consistency. If you removed the cover of the stator housing, carefully inspect the state of the carbon brushes and the lamellae of the rotor collector. The length of the carbon brush should be less than 8 mm. by the way, in Bulgarian BOSCH carbon brushes are used to "shoot", device, Stops the grinder at minimum the length of the carbon brush. Lamella collector must not have any trace of soot or wear. Nagar easily removed with cotton wool, dipped in alcohol. The grinder Bosch series, especially low power, set speed adjusters. Access to the speed controller is performed by opening the handles stator housing, to keep the same socket screws. speed control range can be set via potentiometer, hidden in the handle panel. Defective regulator removed quite easily, as attached only to the rail. Repair LBM speed control is a complex process, the implementation of which requires not only expertise, but the tools and equipment. If the speed controller is out of order, and no new, disconnect supply lines and jumper. Red shows the jumper, installed at the outlet of the speed control system. Bosch angle grinder is designed to perform cutting, grinding, polishing work. Work tool in the dust under a heavy load is particularly detrimental effect on the durability of the gear, namely its gears. In addition to wear and tear of the teeth of gears, for mechanical malfunctions may include destruction of the bearings and housings. Repair Bosch grinders for the replacement of defective bearings, restore the body to perform simple, if there is a desire and a need. Grinder assembly starts with a survey of all parts, knots, bearing, gears. Having first workstation to the correct and good lighting, invest Instruments, lubricants, napkins. Repair Bosch ears will not be quality, If you change when it is performed by a lubricant. For quality of grease grinders Bosch units is recommended to use the lubricants, which offers tools manufacturer. But their high price makes us look for another way out, and he is. Domestic manufacturers of lubricants developed a special lubricant for gearboxes and Bulgarians nodes. On quality they are as good as foreign lubricants, and are much cheaper. The only problem, Our lubrication require more frequent change. And you can use grease, made with their own hands. the rotor assembly is press-fit at his bearings, impeller installation. Lubricated bearings are pressed onto the shaft with a wooden nastavki. Bearing near the reservoir is closed with rubber protection. It is a general algorithm for the rotor shaft assembly. In some models Bosch grinder has its own characteristics. gear assembly begins with the installation in the casing of the rotor shaft. When the shaft is inserted into the housing, the shaft is worn pinion gear, washer and locking nut. gear housing shaft inserted must be placed in the stator housing. 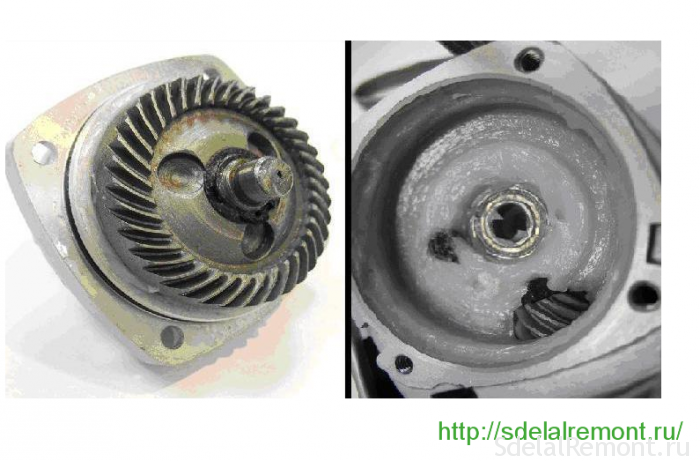 When you insert into the slot bearing reservoir, press down the gear housing to the stator housing. Check ease rotor bearing. a spindle assembly mounted in the lid of the gear housing with the fitted bearing and a pinion. It remains to insert the cover and check the quality of the spindle shaft. If the shaft rotates easily by hand, fashionable to tighten the screws, securing the cover of the rotor housing. Pre-lubricated screw sealant. This is a common gear assembly algorithm. For some models, repair gear grinders Bosch differs slightly. Observing the operation and maintenance of process tool, you will extend the trouble-free operation for years to come.